Friday, Nov. 9, Glen Rose, 8:00 - 4:00, Glen Lake Methodist Camp. Registration opening soon! Learn about erosion and using native plants and other techniques for a healthier habitat! 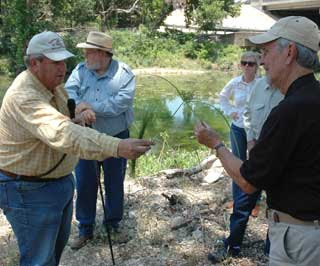 FRIDAY, November 9 Riparian Workshop. Brought to you by Chalk Mountain Wildlife Management Association, Prairie Rose Chapter of the Native Plant Society, Friends of the Brazos, Somervell County Master Gardeners and Rio Brazos Chapter of Texas Master Naturalists. What: NRCS' Ricky Linex and John Sackett are bringing their popular workshop on the function, hydrology and vegetation of our rivers, creeks, streams and seasonal creeks. After lunch, we'll go into the field and observe and discuss what we see. Where: Glen Lake Camp & Retreat Center (Methodist Camp), 102 NE Barnard St. Glen Rose, TX 76043, morning session. Afternoon to be determined, let Sandy know at info@friendsofthebrazos.org or text 512-554-7421 if you would like to be considered for hosting! The instructors will be visiting in early October to find the perfect confluence! Cost: $15 per person, includes lunch. We'll send out additional information on how to sign up, etc. soon.